And most of it is in Brooklyn. One could safely assume that people head to the beach for the sun and the sand, but we're willing to bet most are in it for the foods that go along with spending a day aside the ocean. 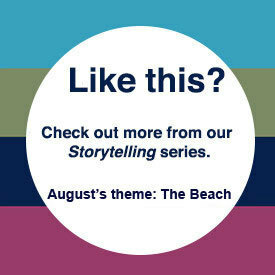 Fish tacos, lobster rolls, ice cream cones and salt water taffy -- these are the eats that make the beach so alluring. Salt water taffy wouldn’t even exist if it weren’t for the beach. While its origins are muddled, popular candy legend credits a shop on the Atlantic City boardwalk for its beginnings. One night, the store was flooded with ocean water and the candy stock soaked. When cleaning up the next morning, a young girl walked in asking for taffy and the clerk responded with an offering of salt water taffy as a joke. The girl took it, loved it, and salt water taffy was born. Salt water taffy begins as sugar, evaporated milk, corn syrup and flavorings that bubble into a stretchy, chewy, melt-in-your mouth candy we love -- after much cooling, pulling, stretching and more stretching, that is. Once the mixture has come to a boil and reached the right temperature, it’s poured onto a prepared surface, folded onto itself to cool, and salted. Then comes the hard part. 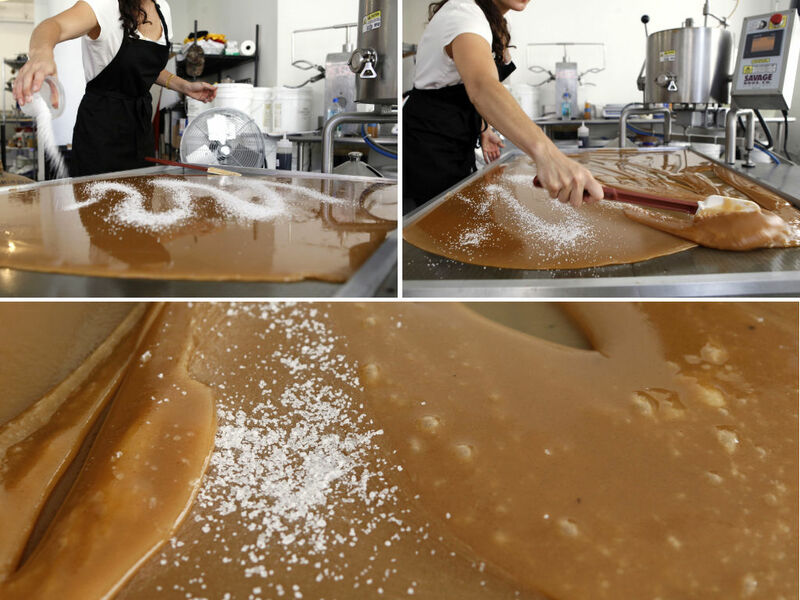 The pulling and stretching is what turns this sticky mess into that light and airy candy that we know as taffy -- and it’s this very process that makes it a recipe most sane people wouldn't attempt at home. 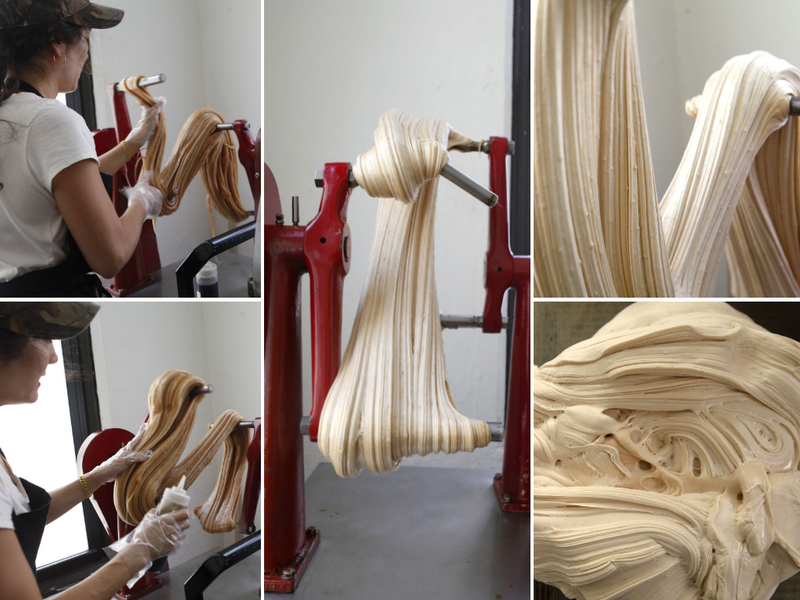 To make really good taffy, you need a lot of air (ahem, a lot of pulling) and only machines are really good at that. That's why we leave to the professionals. Despite its name, many salt water taffy manufacturers no longer add salt to their taffy (if they ever did) -- not even the original producers in Atlantic City. And many use artificial flavors and colors to match. We suspect that's why this candy isn't more popular at the beach. So if you're wondering where all the salt in salt water taffy went, we found it in the heart of Brooklyn, NY. Salty Road, a two-gal production, is making some of the best salt water taffy out there, despite its distance from the sand and ocean. 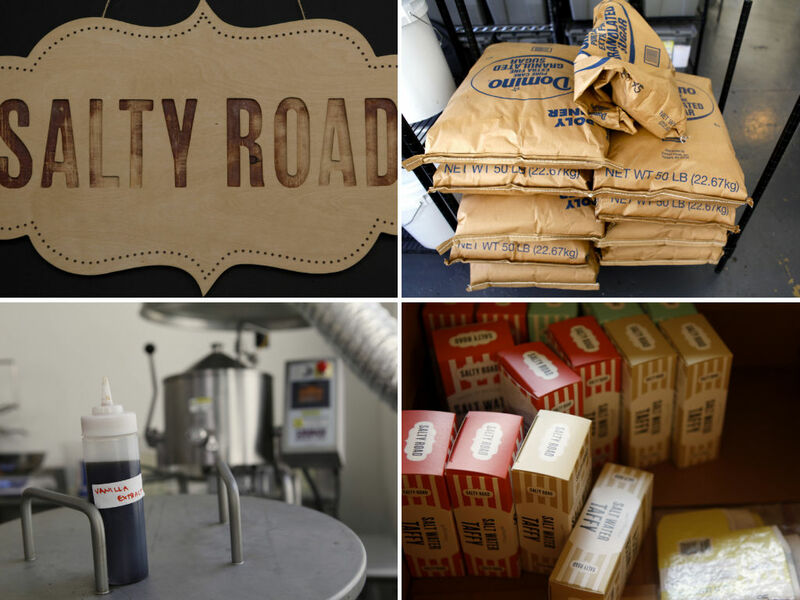 This small producer uses beautiful, large-grain salt to ensure its taffy is salty-sweet. They also use all natural flavorings -- vanilla bean, fruit purees, local honeys -- and offer unique flavors that make packing a box or two of their candy in your beach bag an excellent idea. Marisa Wu, the founder of Salty Road, shared a few of her favorites with us: Vanilla, Salty Peanut and Salty Caramel Apple -- this one’s based on the salted caramel apple pie from the famed Brooklyn pie shop, Four & Twenty Blackbird, where Wu used to work. We’re partial to the citrusy Bergamot flavor. Each batch has to be tested for quality control, so the Salty Road team enjoys a lot of salt water taffy. That sounds like the best part of being a candy maker to us. When we put that question to Wu she revealed that it was a childhood dream realized. She recounts, “I remember being little and calling the big candy companies and telling them that I was going to open a candy store and needed catalogs -- which was true only in my fantasies. But they sent them to me! I can't imagine telling that little chubby kid, 'Just you wait!' We get to create special little treats and are working in a real candy factory!"